Everyone loves a shortcut. In Worcester, MA, I taught a class to high school age students on how to use Excel, Word, and Publisher. I would visit a few times during the semeseter and walk through some hands on labs. It was a lot of fun, and I learned a lot. Most of the time, I would have to work hard to keep the students’ attention, but each semester, I taught a unit on shortcut keys. 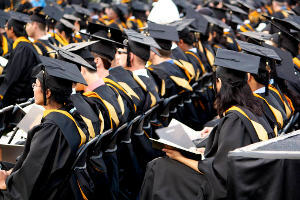 During that portion of the lesson, every student sat on the edge of their seats taking note. CTRL-F (command-F in mac) – Pressing CTRL and F at the same time will bring up a small box, sometimes in the upper right. Simply type the word you are looking for and hit enter to go through each place it occurs. This works not only in the browser but just about every other program including Word, Excel, and Adobe Acrobat. How many times do you find white rabbit mentioned on this page? 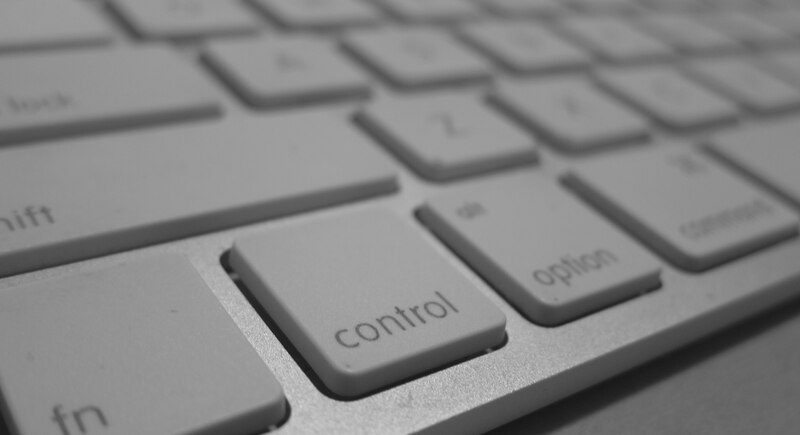 CTRL-T (command T) – Start a new tab. Does your desktop get cluttered up with browser windows? Start a new tab and check your email while leaving your current page undisturbed. Then go back to your original tab by clicking it with the mouse. This will neatly keep all of your browsing in one window. CTRL-ENTER (command ENTER) – Tired of typing all those non-sensical “http://www.” and “.com”‘s? Instead, type the center part (e.g., “google”) and hit CTRL-ENTER. 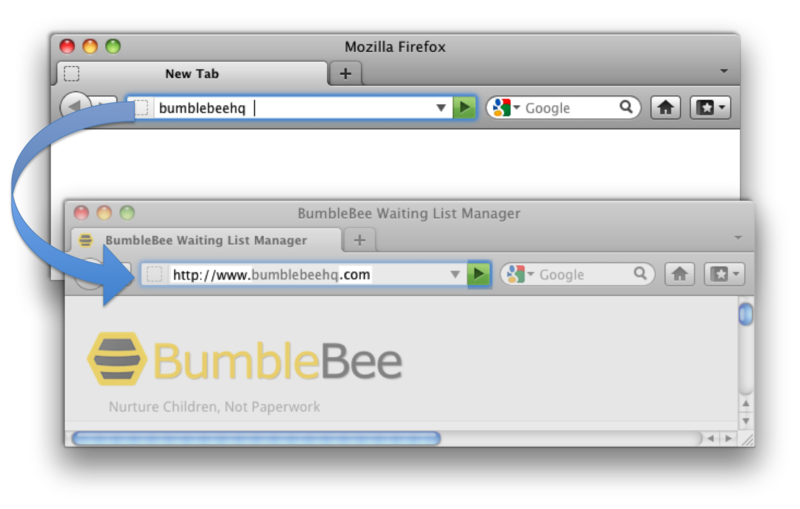 For example, type “bumblebeehq” in the address bar and hit CTRL-ENTER, it will magically create sandwich and add the “http://www.” and “.com” to bumblebeehq and take you to the page. CTRL-ENTER will sandwich your internet address between "http://www." and ".com"
Now that you have pulled the white rabbit out of the hat, the question is: what are you going to do with all of that extra free time? What are your favorite browser shortcuts that you think other childcare directors need to know about? We would like to think here at BumbleBee Childcare Software that everyone is thinking about quality childcare and simplifying waiting lists all year round, but that is just not true. 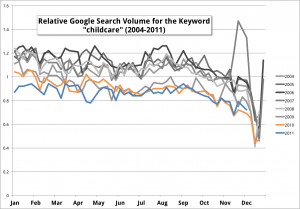 At least, not according to how often people are googling childcare search terms. This should influence everything from when you should pay for Google Adwords to market your childcare center to when you send out that re-enrollment form to families. 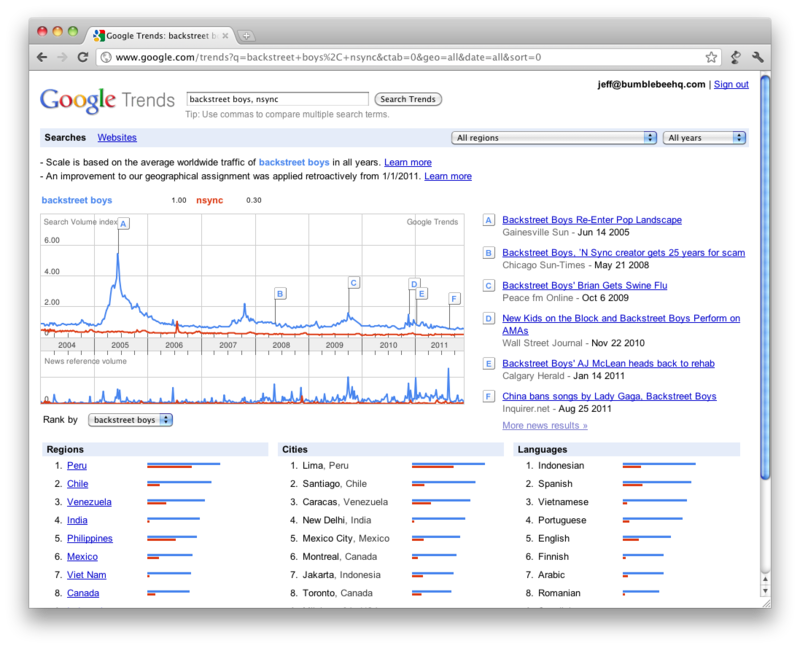 On Google, the keywords "backstreet boys" says bye bye bye to "nsync"
Google Trends (http://www.google.com/trends) is a fun tool for you to make all kinds of unscientific conclusions for just about anything. For example, say you wanted to prove for all time that the Backstreet Boys were and always will be better then ‘N Sync. Google Trends confirms what we already knew, Backstreet Boys rule. Aside from settling old grudges, there are some legitimate teachings that childcare directors can glean from Google Trends. 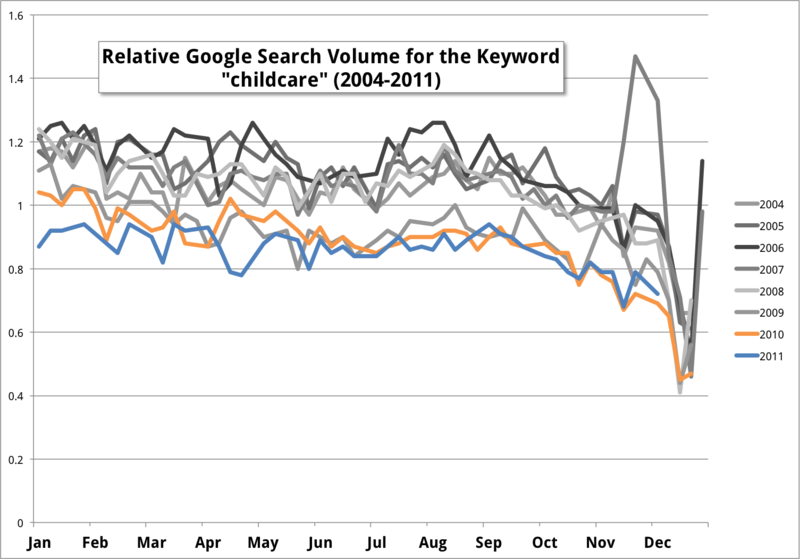 First, on the search term for “childcare”, you will see that predictably, it falls of by one half to one third at this time of year, the end of the calendar year. You do not have to be a childcare director to guess at the cause of that. An implication of that could be that you should budget less for Google Adwords for your childcare center during November and December. 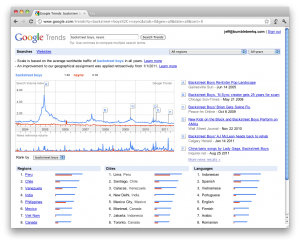 Also, you see that the search volume spikes up in January and gradually falls of throughout the year. This could mean that you want to target your outreach programs like open houses to this time of the year when people are most interested in childcare. Or if you are the contrarian and you zig when everyone else zags, you could target those times when no one else is conducting heavy outreach for your programs. A couple of things to keep in mind. The results are relative. They don’t tell you that childcare was searched for one million times. Only that whatever the average volume is that is equal to 1. Also, key words that overlap with other search terms will confuse the results. For example, brady bunch could overlap with sports celebrity Tom Brady’s dedicated fans. Please tell me what you think? Does this line up with how many interest calls you field at your center? A recent story on WAMU, a public radio station, brought attention to the fact that childcare is the factor that will make-or-break plans to achieve higher education. The story profiles Piedmont Community College in Virginia, which is planning to provide care on campus to remove barriers for parent-students. This story underscores the point that childcare is an important part of our economy, as it enables (or limits) people to learn and work. While researching waiting lists, we have found that on-campus childcare centers are typically in-demand, and have a long waitlist.